In my opinion, you can’t have too many artichokes in your life. Particularly if you don’t eat meat, they provide a really satisfying chewy texture, that’s both delicate and hearty. I love them, and buy jars/tins of them regularly to use in whatever I’m concocting in the kitchen. Their texture is unusual compared to most vegetables – they’re not crunchy, and have more of a soft, aubergine-like feel. I highly encourage you to try adding them to salads, grain bowls and stews for extra texture and flavour. 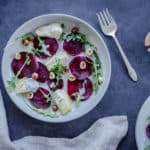 This Winter Beet & Artichoke Salad works really well as a starter or side dish to a protein-rich meal. It’s great to prepare when you’re having friends over because it looks fancy, but really isn’t hard to make! You can impress without being stressed here. The dressing is a simple one of olive oil and lemon. If you find you prefer a tangier, richer dressing, feel free to use the vinaigrette dressing from my Spring Colours Salad recipe. 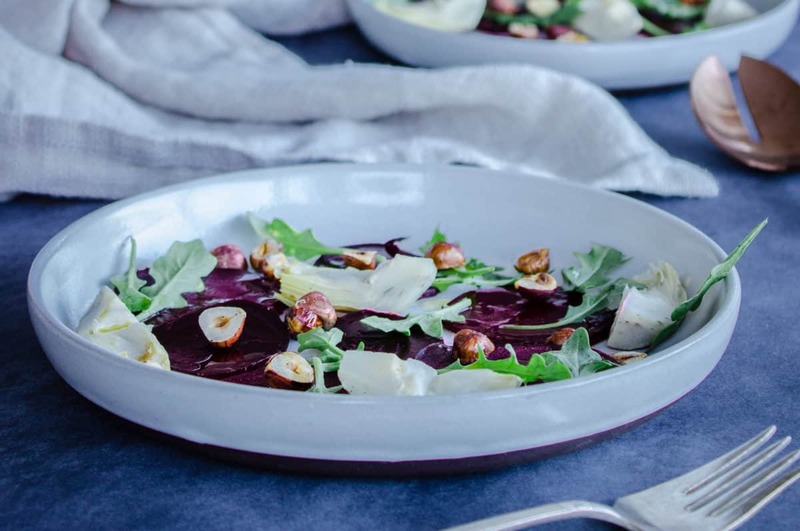 As always, feel free to adapt thisWinter Beet & Artichoke Salad recipe in any way you choose by adding herbs, other vegetables and nuts, – just be aware that by adapting it you will be altering the flavour pairings and could affect the taste quite a lot. Have fun and get creative! 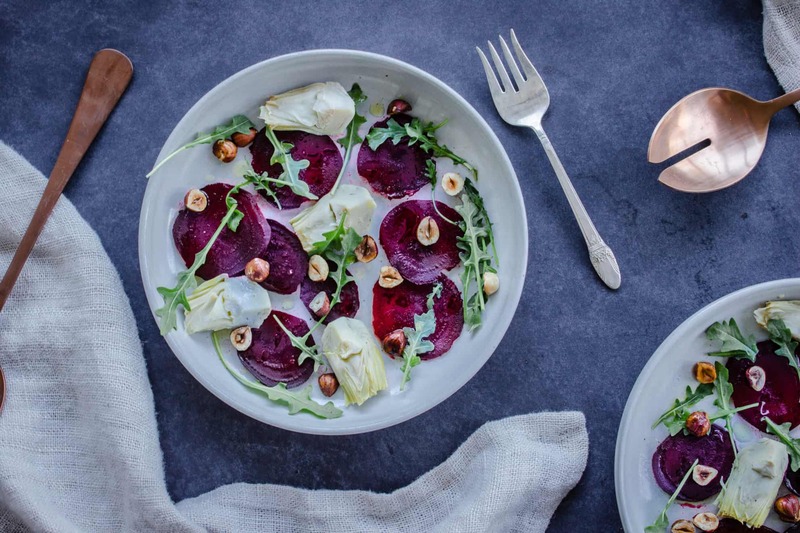 Make the most of seasonal vegetables with this Winter Beet & Artichoke Salad (vegan & gf). It's the perfect side dish for colder days! Preheat the oven to 400°F/205°C. 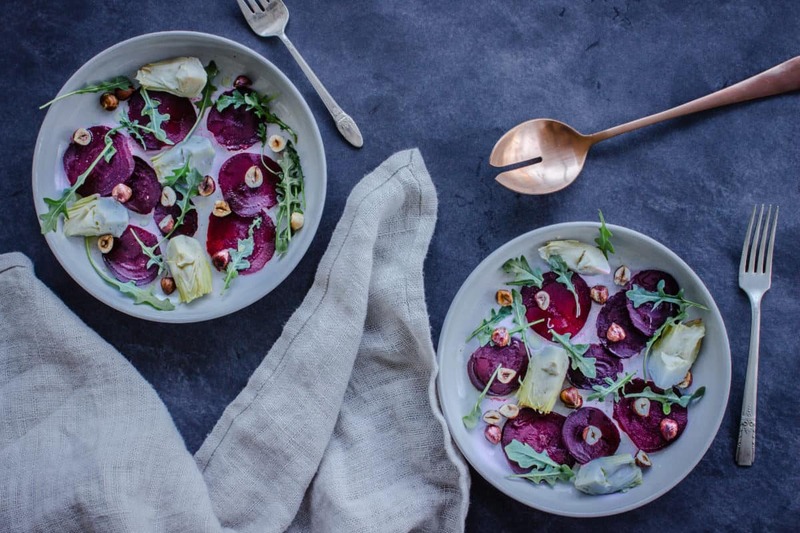 While the beets are roasting, make the dressing. Add all ingredients to a small mason or jam jar, put the lid on and shake it vigorously for 10 seconds. Set aside. Trim the ends of the beets, and using a mandoline or sharp knife, slice them into 3mm discs. Arrange the slices on two plates in a scattered pattern, adding the artichoke hearts and arugula. Sprinkle with the toasted hazelnuts. Gently drizzle the dressing over the top of the salad, and serve. You will likely have some dressing left over from this recipe. It works just as well well with grain bowls and most salads!